IDW Publishing have an interesting new take on a very famous anthropomorphic story. They talk about it over at Bleeding Cool: “IDW will be publishing a gender-swapped adaptation of H.G. 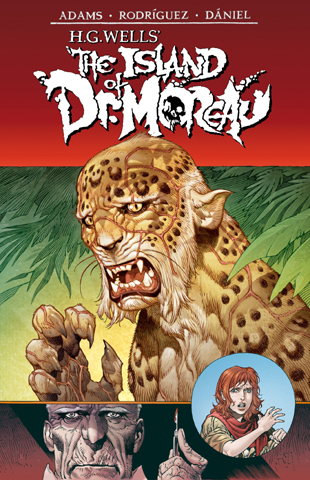 Wells‘ The Island Of Dr Moreau by IDW founder Ted Adams and Locke & Key co-creator Gabriel Rodriguez. Protaginist Edward Prendick is now Ellen Prendick, as the comic book will be told Promethea-style in double page spreads… The Island of Doctor Moreau, an 1896 science fiction novel by H. G. Wells tells the story of a shipwrecked man rescued by a passing boat who is left on the island home of Doctor Moreau, a mad scientist who creates human-like hybrid beings from animals via vivisection. The novel deals with a number of philosophical themes, including pain and cruelty, moral responsibility, human identity, and human interference with nature. Wells himself described it as ‘an exercise in youthful blasphemy’. And it is handily in the public domain.” This new version mini-series is due out in July. 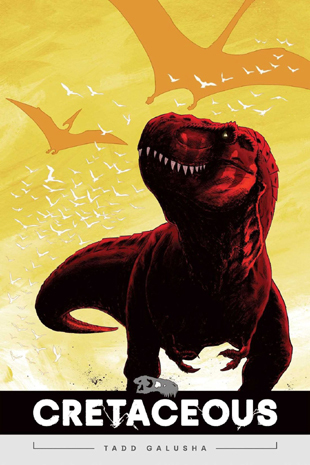 Cretaceous is a new full-color graphic novel written and illustrated by Tadd Galusha and coming soon from Oni Press. “When a Tyrannosaurus Rex is separated from its family unit, it embarks on a harrowing journey to reunite with them before the raw, real dangers of the Cretaceous Era separate them for good. This heart-wrenching story takes to the skies and dives into the sea—and explores everywhere in between—in this research-based, fictional account.” Want more? Go check out the detailed preview over at SyFy Wire. 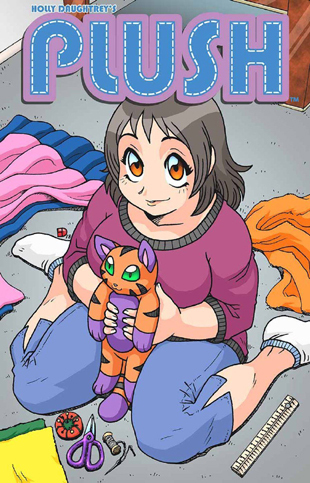 Somehow we missed this last year: Plush, a new full-color comic miniseries from Antarctic Press, written and illustrated by Holly Daughtrey. “Carrie, a crafty plushie maker and artist has lost a great deal in her life, but she’s coping with the help of her late mother’s gift: A special cat plush that suddenly comes to life one night to help. Yet not everything seems right. Is this truly magic? Or is it all in her head?” Check out the preview pages over at Antarctic. As part of their 20th anniversary celebration, IDW Publishing are presenting a special collection of one-shot larger issues called the 20/20 series. 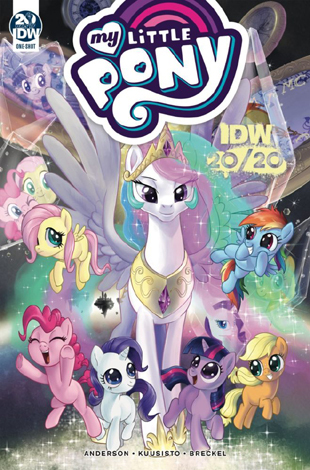 And right there among them is My Little Pony: IDW 20/20. “Ponyville’s most courageous and magical ponies celebrate friendship and fun in this adventure set twenty years in the past! Twilight Sparkle, Rainbow Dash, and the rest of your favorite pony friends are young fillies—surely things can’t get too crazy, right?! One thing’s for sure: no matter what escapades they face, the magic of friendship will see them through!” It’s written by Ted Anderson, with art by Tony Kuusisto and Heather Breckel. IDW has a preview too. 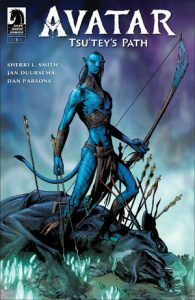 While everyone is waiting with baited breath for director James Cameron to really begin work on the sequel to Avatar (after he brought Pandora to life at Disney’s Animal Kingdom in Florida, of course), now Dark Horse Comics have a new full-color Avatar comic series hitting the shelves — Avatar: Tsu’tey’s Path. “Tsu’tey, proud warrior of the Omatikaya clan, betrothed to Neytiri, has his life turned upside down by the arrival of Jake Sully of the Sky People. Reveals events only hinted at in James Cameron’s Avatar!” It’s written by Sherri L. Smith, and illustrated by Jan Duursema, Dan Parson, and Wes Dzioba. The first issue is available in stores now. And more death and darkness from Source Point Press! (Gee, aren’t furries fun??) Well at least this is from a more silly angle: The Dead Duck and Zombie Chick one-shot comic. “Master cartoonist Jay Fosgitt [My Little Pony: Friendship Is Magic (!) 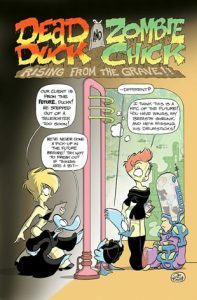 ] returns to his darkly comedic roots with the return of Dead Duck and Zombie Chick! Laugh along with the deadpan humor as Dead Duck does his best to keep up on his day job….delivering the souls of the dead for processing!” And it’s available for your viewing pleasure now. And more dark stuff from the Long Beach Comic Expo. Remember when we talked about the graphic novel Wretched Things? 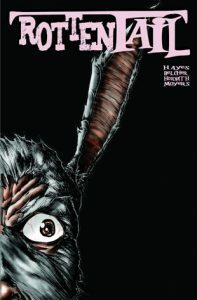 Well it turns out that the publisher, Source Point Press, has another creepy anthropomorphic title in their crop: Rottentail. “This deranged graphic novel comes straight from the minds and hands of David C. Hayes, Kevin Moyers, Kurt Belcher, and Henrik Horvath. Geeky fertility researcher Peter Cotton is bitten by a mutant rabbit and changes into the half-man/half-bunny Rottentail. What’s a boy to do? Why, take a hippity, hoppity trip home of course! Peter begins a bloody killing spree of revenge that culminates in his childhood hometown of Easter Falls.” Ready for this? Rottentail has even been made into a film! Honestly, we never knew this was back there — and now here it is right in front of us! Turns out that Aspen Comics have been running a series for young readers called Aspen Mascots as back-up stories in other comics for some time now. Finally, they have gathered them all together and put them out in Aspen Mascots: The Complete Collection. 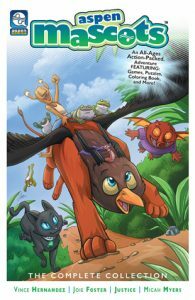 “Aspen Comics’ most popular mascots, critters and creatures star in this all in one jam-packed comic, coloring and activity book! Join Wormier, a fearless millipede, along with his lovable sidekick Griff, as they plot to go back in time in order to reverse the destruction of his worm village! Along the way, the pair will discover different eras, allies-and enemies! Plus, with over 5 incredible bonus stories, readers and fans alike will be able to color in the fun with added puzzles, exciting activities and a whole lot more!” Take a look over at Comixology. Evidently this has been a thing for a while, but somehow we missed it. Now, thanks to Oni Press, it’s all together in one place. 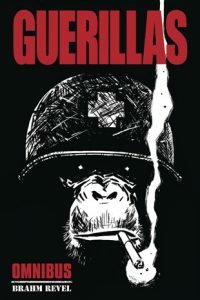 “Brahm Revel’s critically-acclaimed series is collected for the first time in one volume in the Guerillas: Omnibus Edition! Private John Francis Clayton is on his first tour of duty in Vietnam, facing death at every turn in the middle of a war he doesn’t understand. Clayton is just trying to stay alive when he encounters an elite platoon of…. simian soldiers?!? This squad of chain-smoking chimps is the most dangerous fighting force in the jungle… but whose side are they on?” Find out when this hits the shelves in late March.